Nothing rivals the sweetness of a good memory. But there’s always room for new ones. I prefer my scones rather simple; not too moist, not too sweet. I’m more into getting that fluffy texture with nice little air pockets and a decent crumb than I am about worrying if they are (from an American standpoint) too dry or (from a British standpoint) too moist. 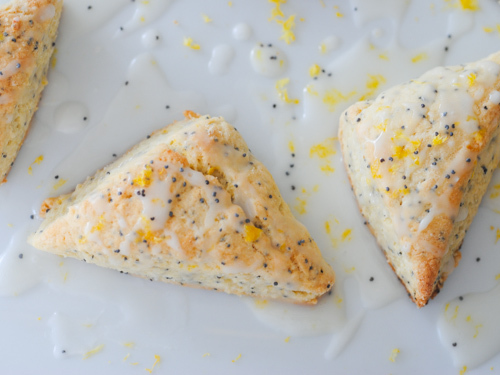 Check out my running list of scone recipes for some variations that I adore. Out of the three (savory Goat Cheese, Chive and Walnut and gently decadent Peanut Butter, Banana and Chocolate, which will be up next week), this is the most “traditional” of the scones I’ll be bringing Sunday. Not too moist, packed full of fresh, bright lemon juice and with most of the sweetness coming from the glaze. And because there’s no milk in the actual recipe, you can easily swap out the butter for butter-flavored Earth Balance to make them dairy free as well. Makes 20 mini scones or 6-8 large scones, depending on your preferences. These are also nut and soy free, and substituting the butter for Earth Balance makes them easily dairy-free as well! I suggest having three lemons on hand, though you might only need two; depending on the size and how much zest/juice you can get out of them. Extra rice or millet flour, for your pastry board and sheets, if necessary. Preheat oven to 375°. Line a baking sheet with Silpat or parchment, if you have them. If not, dust lightly with a little extra rice flour. Whisk together flours, baking powder and salt in a large bowl. Cut the butter into 1/2″ cubes and start to work it into the flour with the tips of your fingers. Work quickly so that you don’t melt the butter, until the flour is like a loose cornmeal. Stir in the sugar, poppy seeds and about 2 Tbsp lemon zest (for me this is about the zest from one large lemon). Make a well in the center and add the egg and 1/4 cup lemon juice. With a fork, start pulling the flour into the wet mixture until it starts to form a dough. With your hands, quickly knead it (while still in the bowl) until it just comes together. On a lightly floured board, take 1/2 of the dough and knead it four or five times until relatively smooth. Roll out into a 12″ long log, patting down the tops to round slightly if desired. 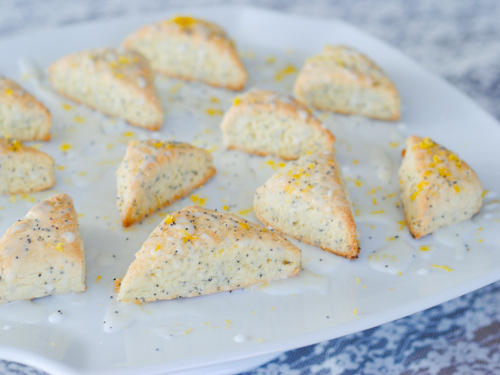 For mini scones, cut into 5 rectangles, and then those in half to 10 triangles. For full-sized scones, cut into 3-4 large triangles (the original recipe was set to make 6 very large scones, but I prefer them slightly smaller). Place scones on baking sheet and repeat with remaining dough. Bake for about 12 minutes for mini scones, about 18 minutes for large ones, until just firm at the top. While the scones are baking make the glaze: place the remaining 2 Tbsp in a small bowl and slowly start whisking in the powdered sugar until completely dissolved. Do this gradually so you don’t get any clumps. Keep adding until your glaze is thick enough that it drizzles easily off a fork, but thick enough so that it sets when it falls, about 1/3 to maybe 1/2 cup. 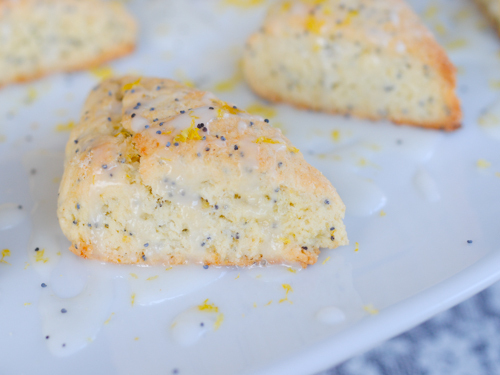 When the scones are slightly cool, remove to serving plate, drizzle with glaze and sprinkle with extra poppy seeds and freshly zested lemon. These sound so yummy. I bet they are going to go over big! Peanut Banana Chocolate?!?!? I’ll wait right here…..